At Wellspring Church, I learned about an African man named Royie, walking to different parts of Malawi to help others, and he has no shoes. Wellspring was going to raise funds for Royie to get a motorbike. I was thinking that it would be fun to have a fun-raiser and to help somebody. I thought a good fun-raiser would be a movie night because I LOVE movies. 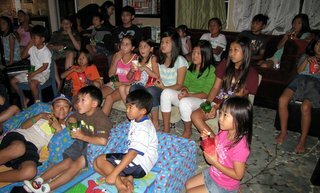 With a donation, guests experienced a pizza dinner, time of worship led by Joey Chen and Noah Lee, carrying 2 gallons of water like a child in Africa, and a movie with popcorn. I invited my Sunday school group, my close friends, and my family. I was happy to be able to help Royie with the help of my friends and family. Hannah is a 10-year-old girl from northern California. 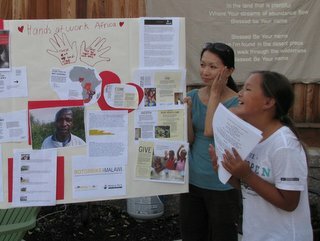 She attends Wellspring Church with her parents, where she learned about Hands at Work in Africa. Hannah loves school, especially reading, and she loves baking (and eating what she bakes!) and riding horses.